Its springtime and that means many of our animals will be welcoming their babies! 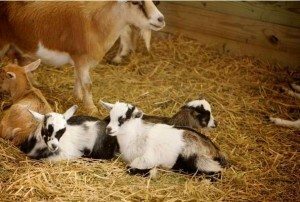 Our Animal Barn becomes a nursery with baby goats, pigs, chicks, kittens and more! In addition to Acres of Adventures, puppet shows, animal demonstrations, and special seasonal events, save some time to mosey on out to our egg field. Farmer Gary’s chickens have flown the coop and laid colored eggs all over his alfalfa! Meet Farmer Gary at the hay wagon and take a ride out to help gather up the eggs; then have some fun dropping them down our giant plinko board! Concessions on site are provided by the FFA Alumni Feedbag, including snacks, sandwiches, hot and cold drinks, and sweet treats. Open week-ends, visit our website for dates, times and events, as well as group event information. We look forward to seeing you this spring!